Coolz0r commences another contest, calling for campaigns and links to generate the most comments and trackbacks. While it seemingly could be rigged (hmm, wonder why 15 commenters all use gmail...), the contest a couple weeks ago seemed to be a success. The prize last time was Dragon's Naturally Speaking software. This week, the marketing thoughts blog ups the ante with an ergonomically designed keyboard straight from CeBIT. The Wolf King Warrior Gaming Keypad defines itself as the ultimate gaming weapon, though, by the looks of it, it seems more likely to be the ultimate one-handed typing accessory. 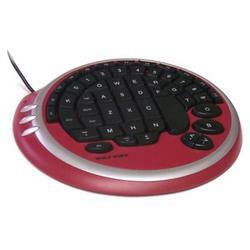 The Keypad states, "Perfect for PC Gamers looking for a portable game pad or just looking for more flexibility". Perhaps "just" looking for more flexibility, indeed. Coolz0r's link submission contest ends April 7, so CTRL+V those permalinks over.